(Nanowerk News) Gelatin is used in the pharmaceutical industry to encapsulate active agents. It protects against oxidation and overly quick release. Nanopores in the material have a significant influence on this, yet they are difficult to investigate. In experiments on gummy bears, researchers at Technische Universität München (TUM) have now transferred a methodology to determine the free volume of gelatin preparations ("The Free Volume in Dried and H2O-Loaded Biopolymers Studied by Positron Lifetime Measurements"). Gummy bear on the experimental set-up. 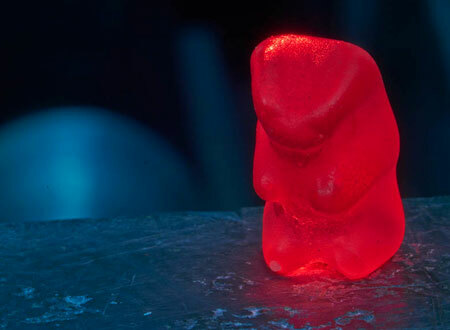 To prevent color influences, the researchers used red gummy bears only. Custom-tailored gelatin preparations are widely used in the pharmaceutical industry. Medications that do not taste good can be packed into gelatin capsules, making them easier to swallow. Gelatin also protects sensitive active agents from oxidation. Often the goal is to release the medication gradually. In these cases slowly dissolving gelatin is used. Nanopores in the material play a significant role in all of these applications. “The larger the free volume, the easier it is for oxygen to penetrate it and harm the medication, but also the less brittle the gelatin,” says PD Dr. Christoph Hugenschmidt, a physicist at TU München. However, characterizing the size and distribution of these free spaces in the unordered biopolymer is difficult. A methodology adapted by the Garching physicists Christoph Hugenschmidt and Hubert Ceeh provides relief. “Using positrons as highly mobile probes, the volume of the nanopores can be determined, especially also in unordered systems like netted gelatins,” says Christoph Hugenschmidt. Positrons are the antiparticles corresponding to electrons. They can be produced in the laboratory in small quantities, as in this experiment, or in large volumes at the Heinz Maier Leibnitz Research Neutron Source (FRM II) of the TU München. If a positron encounters an electron they briefly form an exotic particle, the so-called positronium. Shortly after it annihilates to a flash of light. To model gelatin capsules that slowly dissolve in the stomach, the scientists bombarded red gummy bears in various drying stages with positrons. Their measurements showed, that in dry gummy bears the positroniums survive only 1.2 nanoseconds on average while in soaked gummy bears it takes 1.9 nanoseconds before they are annihilated. From the lifetime of the positroniums the scientists can deduce the number and size of nanopores in the material.